Right off the bat you must know that my computer monitor is a cathode ray tube (CRT) monitor. It is a Dell. I calibrate it every once in a while by making the gray background of my blog gray without any bits of blue, yellow, magenta, green or cyan. When I send my digital files to Grant Simmons at DISC so he can make some of those wonderful giclées, my prints are exactly as I expected them. And furthermore when I see my files on his super calibrated Mac monitor my pictures look exactly as the do on my CRT. Next to the living room, where I have my monitor, computer and scanner is a small den with an excellent fireplace. In a corner is a medium sized Sony Trinitron (yes it also has a bulky cathode ray tube protuberance on the back. Rosemary and I have no way of connecting the computer to our TV should we want to watch what is on the computer or if we would download from Netflix. We are happy as we are. And we are happy as we are because thanks to our excellent Vancouver Public Library and Limelight Video we get to see all that wonderful stuff that is not mainstream. You see, Rosemary and I keep our noses very high because we are highfalutin snobs. We have never watched Law & Order or any other American made TV program. I saw one Breaking Bad and one Mad Men a long time ago and that satisfied me that I was not missing anything. Rosemary and I like foreign films and in particular films that never have animated characters with the voices of famous Hollywood actors. We do watch police procedurals. We like our policemen to have lots of existential angst. We have seen, now, 18 episodes of the Italian series Montalbano. As I write this Rosemary is reading her 8th Andrea Camilleri, Montalbano novel. We like existential angst and we saw the few in the British series (that made only a few) that featured Michael Dibdin’s Aurelio Zen and Robert Wilson’s Seville cop Falcón. What is next? Rosemary was not keen on having our dear Inspector Brunetti (Dona Leon’s detective based in Venice) speak German as the series is made by German. So we tried Wallander. But I did not think Rosemary would approve of the original Swedish series in Swedish. We have seen two Wallanders with Kenneth Branagh. And we like Branagh’s Wallander because he is full of existential angst, suffers from a horrific and enervated work-related-stress and by the second episode he is diagnosed with Type 2 diabetes. Rosemary and I have come to the conclusion that Branagh’s tired look cannot be just makeup. We imagine him going days without sleep and he perhaps smokes a few tokes to get those bloodshot eyes. The man looks like he is about to collapse. We love him and we love the slow pace (so unlike the quicken-it-up-time-is-money American method) of the show. Better still that first episode featured my very favourite British actor, David Warner, as Wallander’s father, a painter suffering the early stages of Alzheimer’s. 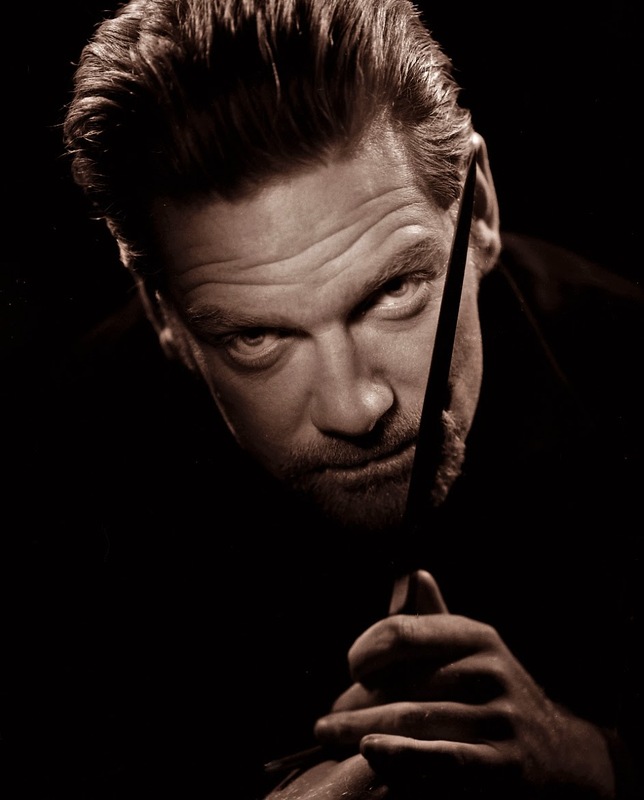 I met and photographed Kenneth Branagh some years ago. The perennial question that most people ask me is, “What was he like?” My usual answer is that I have never been able to penetrate, as far as I know, the mask of the actor, except once. The man in question was a young Christopher Gaze who played Richard III in an early version of Bard on the Beach in 1984. Gaze played the hunchback with a withered arm Richard. It was amazing to watch him. I wondered how this man could possibly woo the very women whose husbands he had sent to their death. At the end of the play (there was no curtain bowing as there was no curtain) Gaze would bow to our applause and he would then straighten up and shift from Richard III to a man I would soon get to know as Christopher Gaze. I can assert that Branagh made only one mistake in his life and that was to leave his wife Emma Thompson. When I photographed the man (he was courteous, warm and low key) he was having an affair with Helena Bonham Carter. Since I had photograph Bonham Carter a year before I shopped for a Pugwash, Nova Scotia pewter locket and inserted one of my snapshots. He was most grateful. As Rosemary and watch Wallander we marvel as how the man can make a scene without saying anything. He uses his eyes. He might think of a smile without smiling quite. He is to Wallander what Lucca Zingaretti is to the Montalbano series. And we formally thank here the VPL and Limelight Video for making accessible to us the good stuff.